Then finally we hopped on to the MPV and checked in to the hotel. Noel and I in the MPV. Weather was damn hot. 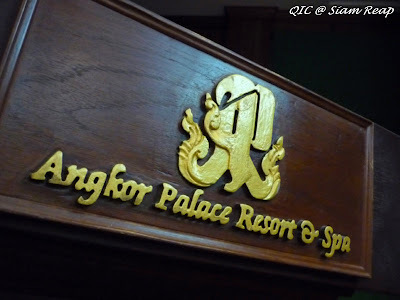 Angkor Palace Resort & Spa. Received a warm welcome from the organizing committee. Now I have a Cambodian scarf with the printed Philips Lighting QIC logo. My room. Nice isn't it. Tomorrow we will be entering the battle field. Not forgetting to promote "Sense". The Challengers on the stage. Our presentation will be done here tomorrow. Our aim of course, is to go to Marrakech. Who doesn't want to? My first nametag strap, from Philips. Wish you a pleasant stay in our resort and a memorable trip in Siem Reap, Angkor.